Read 2 times. Last read June 28, 2016. If you've never heard of Kit Melbourne, there's no reason why you can't learn about her here. These are the books in which Kit settles into her job as Dayrunner for the Vampire Guild Leader. There's plenty of action and intrigue as she learns to navigate the human-hating Guild and develop her growing power. Because the first three books involve Kit's tumultuous romantic problems (which are resolved happily in Dayrunner) the romance in this book largely occurs between secondary characters. Kit's challenges in that regard are mostly involved with marriage, childbirth, and the struggle of maintaining a work-life balance when you're the Dayrunner and people will die if you don't do your job right. In FAERIE KILLER, Kit and Morales (a vampire who is on the outs, politically) are put in charge of a murder investigation to discover who killed an innocent vampire and her roommate. The investigation takes up so much time that Kit delegates her wedding planning to her mother--with disastrous results. In CHANGER'S TURF, Kit uses genealogy research to track down the location of children who were kidnapped by werewolves. If she can't find them before the werewolf pack officially adopts them, the boys will be gone forever. What she doesn't realize is that someone is leaking her secrets to a dangerous man who wants to find the boys first. In HAWTHORN HEX, someone uses blood magic to destroy the ward that once protected the city from rogue vampires. Kit's boss thinks she has the ability to make a new ward, a stronger one, even though what he proposes never been done before. But how can Kit keep her city safe when the enemies are inside her own home? 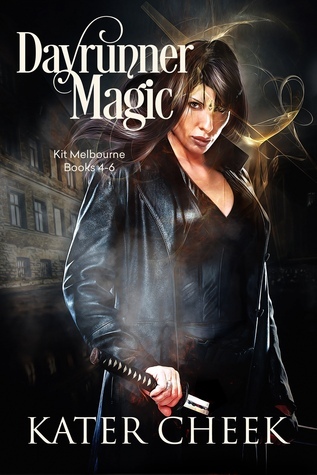 This is a reprinting of the second three Kit Melbourne books. If you're hoping for the sequel to HAWTHORN HEX, this is not the right book. This book has minor changes from the previous versions of these novels. It's available in a handsome paperback, and matches the recently released BINDI MAGIC which contains the first three novels. Sign into Goodreads to see if any of your friends have read Dayrunner Magic.